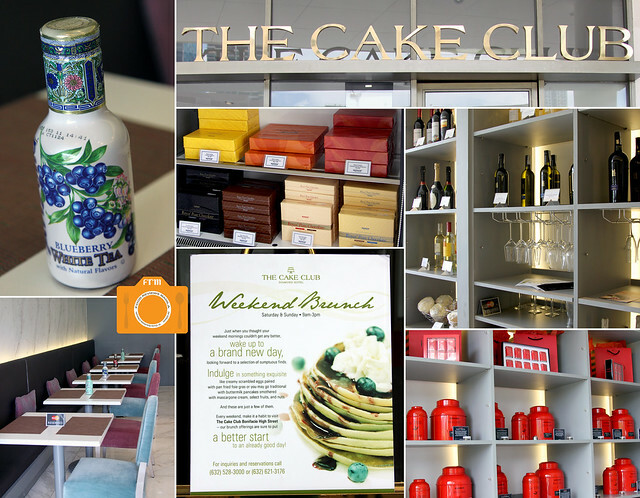 I'm amazed to find such a good place for brunch at The "Cake" Club. I've always wanted to try The Cake Club, but then again, I've always wanted to try a ridiculously huge number of other places, too. Seeing as it might be mostly pastries as the name would somehow obviously suggest, it wasn't really high up there on my list. One bright Saturday morning though, I finally had the chance to try it out. The place itself was bright and spacious. Upon entering, a large display glass case stood at the center, forming a squarish perimeter, the length of which kept some of the most beautiful cakes you will ever see. Flanking it were shelves filled with Royce' chocolates, cans of ice cream, red tin urns and boxes of Hediard tea, and some bottles of wine. They were offering a great selection for their Weekend Brunch menu and as I scan the list of dishes, a delicious tingling sensation crept up my spine, and my mouth started to water as the gears of my imagination kept churning out images of what these sumptuous-sounding dishes might possibly look like. 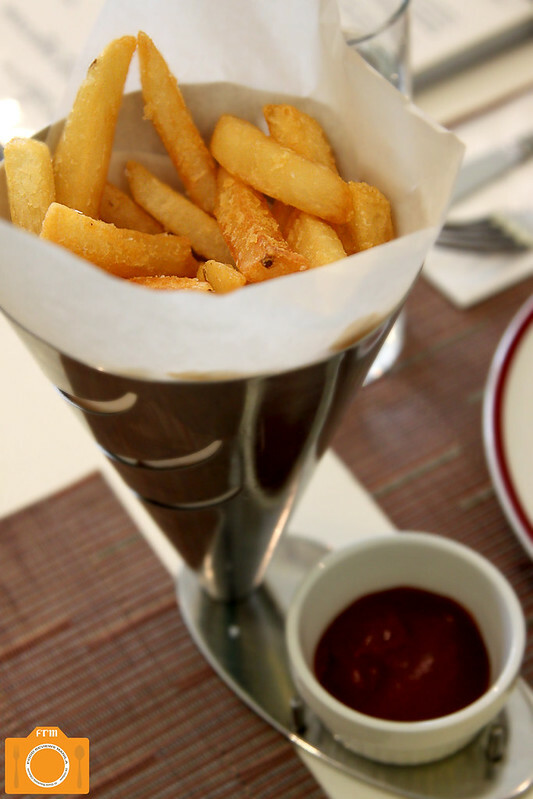 Never have I encountered Truffle Fries (P180), or truffle anything for that matter, as aromatic as this. Blatantly apparent in fragrance, each of these crisp and crunchy sliced potatoes is dusted with sea salt flakes for that right touch of salinity. I like Muesli, albeit I usually eat them dry. Anything remotely opposite does not come off as palatable to me since it already becomes redolent of mushy Quaker oats which I abhor. The Bircher Muesli (P265) was surprisingly anything but. 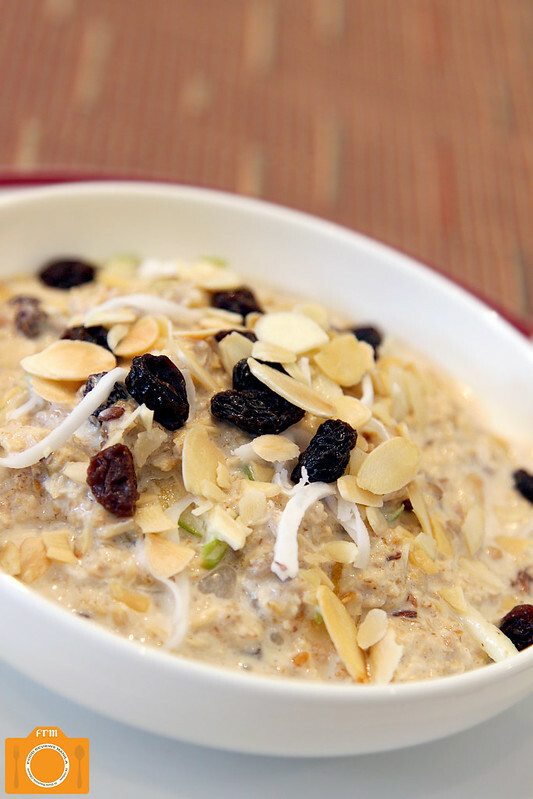 I don't know how they did it, but the whole mix of rolled oats, assorted dry fruits, coconut ribbons, and green apple bits soaked and drenched in yogurt and milk, miraculously worked. I think the textural contrast offered by the slivers of almonds and dried fruits helped eliminate the usual overpowering mushiness of such a breakfast dish. 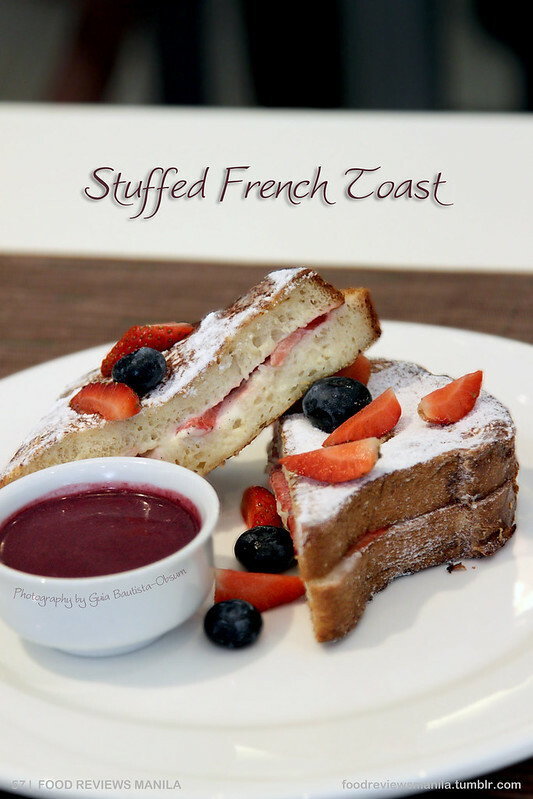 I adore french toasts, and although this Stuffed French Toast (P295) was a bit far from the conventional ones, I relished the Brioche bread lathered with cream cheese and fresh strawberries. Dip it into the wild berry mascarpone sauce and the resulting flavor profile was nothing short of amazing. It was sweet but rightfully so, and the tartness of the sauce complemented the whole thing well. Fork in a couple of those fresh blueberries and strawberries to end it cleanly, then surreptitiously wipe the corners of your mouth of the powdered sugar that clung with each bite. The only thing that probably gave way that this used whole wheat, was that it was less airy and fluffy than what you would usually expect of pancakes. Or maybe that was because it took a long time before I had begun to eat it and the bread had already aired out. 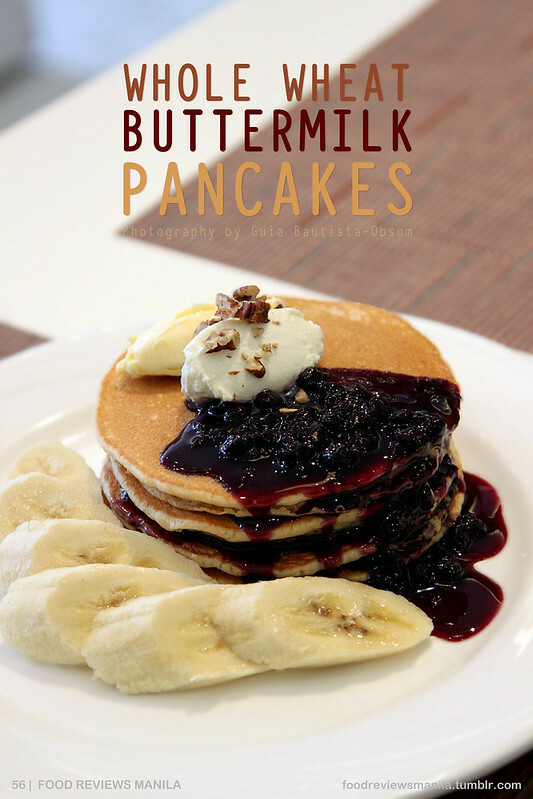 No matter, the Whole Wheat Buttermilk Pancakes (P295) were still scrumptious with its homemade blueberry preserve scintillatingly cascading down layers of circular flapjacks. 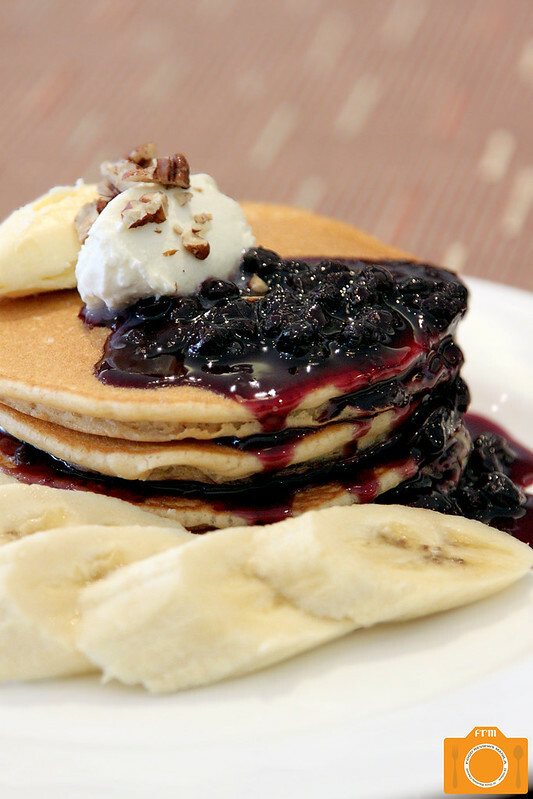 A dollop of mascarpone cream sprinkled with ground pecans presents a stark contrast to the dark syrup, and slices of bananas line half of the pancakes' circumference, lending a mild sweetness to the richness of everything else. This, perhaps, is my least favorite dish. 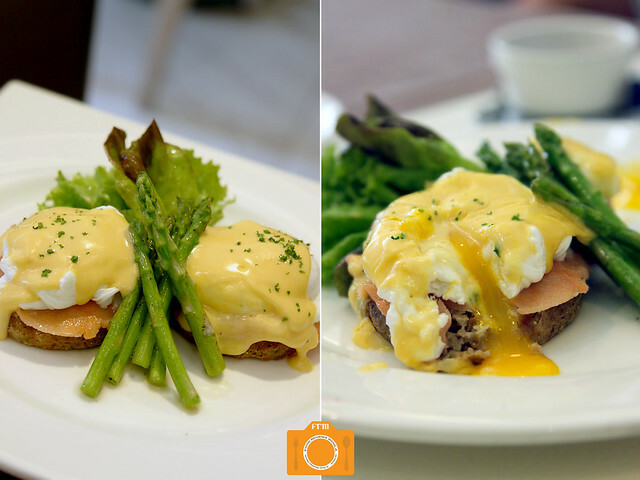 In words, it sounded just perfect -- Smoked Salmon Benedict (P345). I was eagerly anticipating sinking my teeth into those treasured golden orbs. They, themselves, were actually great. A thick, golden fluid slowly seeped out like a waterfall from its white recesses. A few shades lighter was the hollandaise sauce, just like a liquid mantle diffusing on top. It was rich and creamy, and tinctured with a tang, gently flowing toward the light pink salmon wedged in between. The bottom layer was what I wasn't too fond of. Whole wheat and quinoa pancakes it was called, and had this squishy composition that wasn't exactly agreeable to my palate. I'd rather have my eggs benedict with something else. In hindsight, I think I falsely thought it to be some kind of meat so that was what my taste buds were looking for, and having some whole wheat pancakes grace them instead, just was a bit of a letdown. 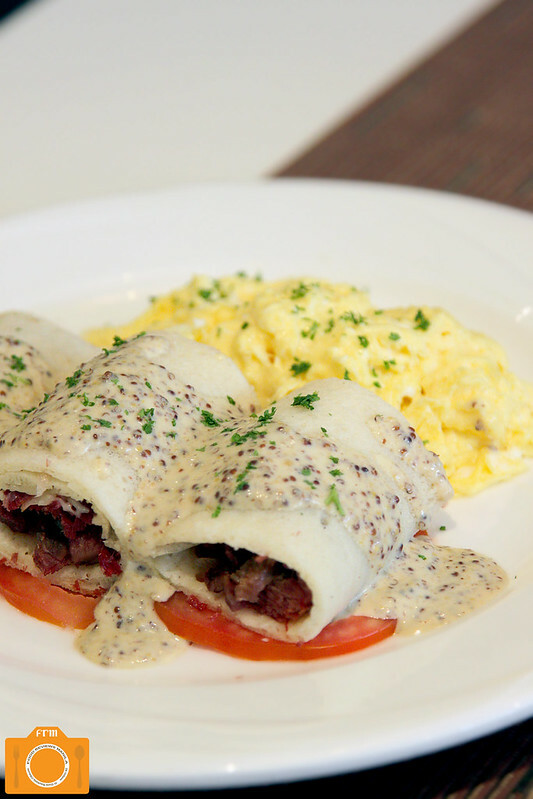 The Homemade Corned Beef Stuffed Blinis (P325) comprises of three rolled up pancakes, each embracing a generous amount of dark red corned beef mixed with caramelized onions. Whole-grain mustard sauce is poured over the trio, while large sliced tomatoes peek from the bottom. 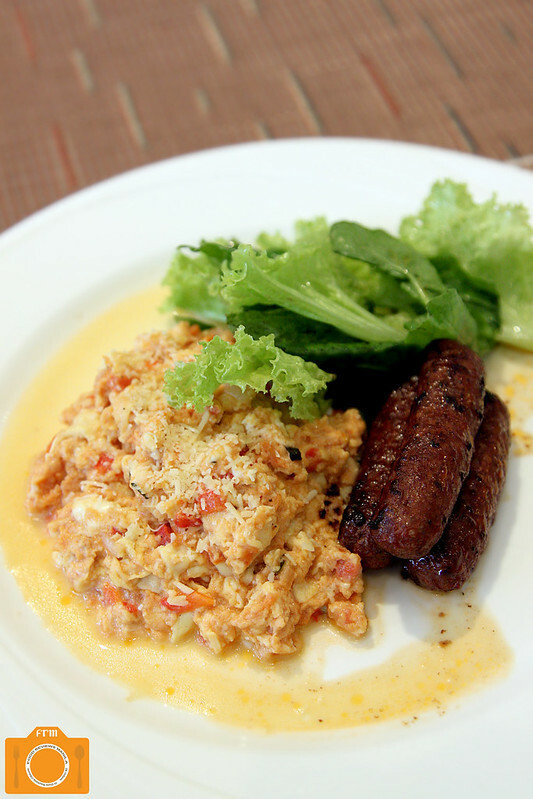 On the side abounds a mountain of creamy scrambled eggs, balancing the beef's sapidity. I generally don't have a proclivity for corned beef; nonetheless, this was good. I loved the Mediterranean Eggs (P355), though failing to include the lamb sausage in the dish title is beyond me. Everything was just put together beautifully. The savory taste of the sausage was nicely enhanced by the scramble of eggs, tomatoes and feta cheese, plus with a tinge of a spicy endnote to boot. I frankly couldn't ask for anything more than perhaps another round of this highly satisfying dish. It's what I want in my breakfast -- something savory, something hearty, something just plain delicious. Another awesome plate was the Pan Fried Foie Gras (P365). A heap of creamy scrambled eggs is sprinkled with herbs, and a bite gives way to such light and fluffy omelette that went impeccably well with the exquisite foie gras lightly speckled with crystals of salt. With brownish edges marked by the pan, the fat liver had a saporous flavor coupled with this buttery consistency that makes it so remarkable. If I had to order just one dish, this would be it. 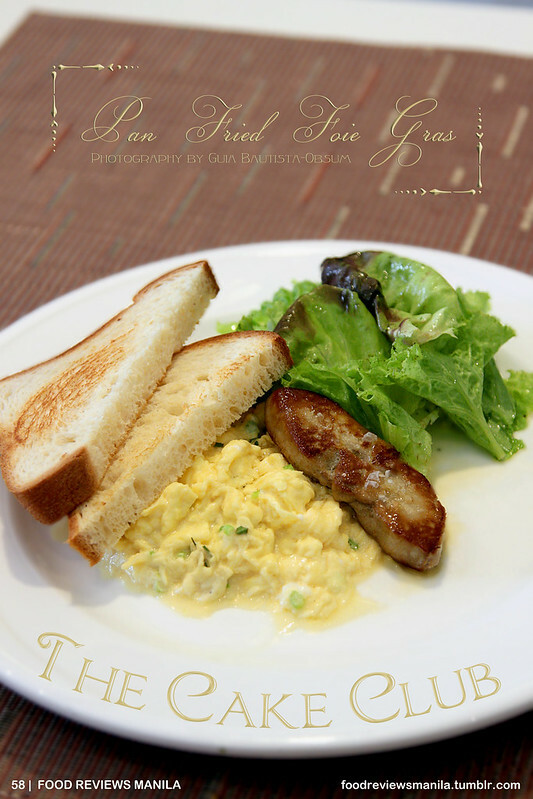 Weekend Brunch is available during Saturdays and Sundays, from 9 AM to 3 PM. I still think they should have made it everyday. More savory fare and great treats on my next post! You make the food look so sinful!!!! I haven't tried this one yet (boo-hoo!) but going by your review, I must find the time to drop by. Like pronto! :D I'm eyeing the pan fried foie gras!